The current legislative session's HB 0157 will create a new SR-194, which will replace the east-west section of SR-85 (currently ut.ut085leh in TM). 85 will be truncated back to Redwood Road, soon to be extended southwest over the new segment of the Mountain View Corridor to SR-73. Obviously, none of this is official yet, and to my knowledge that east-west road is still signed as SR-85. Otherwise I'd have put this topic in the "updates to highway data" section. Is this enough signage to make the change? 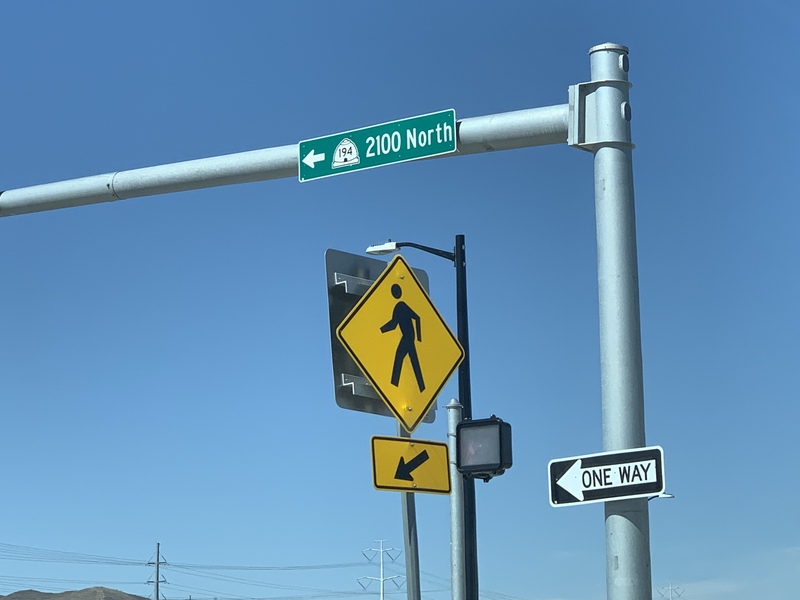 Normally street sign blades only is not sufficient to count a route as "signed", but this route was already signed as a different number and the designation was clearly officially changed, with intent to change the signs. I'll... go ahead and update this next time I'm submitting updates. Note that "UT085Leh" can be left as an alt name for the route, so no one already claiming mileage will need to update their list files (unless they want to). Ooooh so here's a fun tangle. Originally, only the UT 85 segment that is now UT 194 intersected UT 68. It, naturally, had a point labeled "UT85". When the other, still current segment of UT 85 was extended to meet UT 68, it got a point label "UT85_N" while the intersection with what's now UT 194 was made "UT85_S" with "UT85" left in place as an alt label. Problem is, now we're back to UT 85 only having one intersection with UT 68... but it is at a different location from where the alt label "UT85" is, and yes, that alt label is in use. As of now, to avoid making anyone's travels map incorrectly, I'm leaving "UT85_N" labeled as such so that "UT85" can remain in place as an alt label for UT 194 (the primary label "UT85_S" is not currently in use so it won't be preserved). I don't quite like the lack of tidiness with this but I also don't see any way around it without either forcing anyone who is currently using "UT85" to change it to "UT194" in their list files, or accepting that reusing the label name will cause an unsafe failure in their mapping (will map incorrectly, will not generate an error). This kind of issue comes up all of the time. Whenever a highway is rerouted, any route that intersects with both the old and new routing will have its waypoint moved. Sometimes, the new waypoint can be labeled differently, but that is a rare case. IMO, labels should be properly made. If that makes somebody's .list file have an undetected error, so be it. I have occasionally found such an issue in my own .list file and have corrected it on my own. There was another situation (I-95/I-295 renaming in PA IIRC) in which some users were alerted to an issue where their list files needed to change. There's no sneezy username used in the TM forum, so perhaps Jim could get in touch if you want to switch the point for UT85.